What is a Trikke Pon-e? It is a 3 wheeled electric carving vehicle that is designed to make your commute and/or recreational ride a lot of fun! 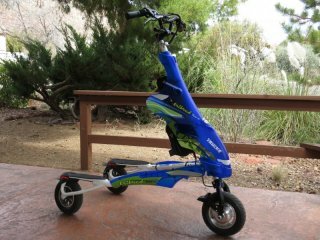 The Trikke is similar to skiing, but on land! This is not an electric bike, but it is similar in that it is a light electric vehicle (LEV) that is powered by an electric motor and your motion (if you choose). A variety of LEV’s have hit the market recently in the form of e-kicks scooters, e-skateboards, and the Trikke Pon-e.